A helpful new book demonstrates the power of skillfully blending branding and technology. It’s already a part of my regular reference library. Author Vinay Trivedi is an entrepreneur, investor, and tech enthusiast with a computer science background from Harvard. Through his experiences, he realized that nontechnical individuals often struggle to understand the basic technology. This can be especially true for brand marketers and agencies as they try to express their ideas and creative brainstorms on the palette of modern technologies. Like Imagineers and computer geeks at Pixar, it takes a common platform of communication to make the magic stories come to life in the digital age. 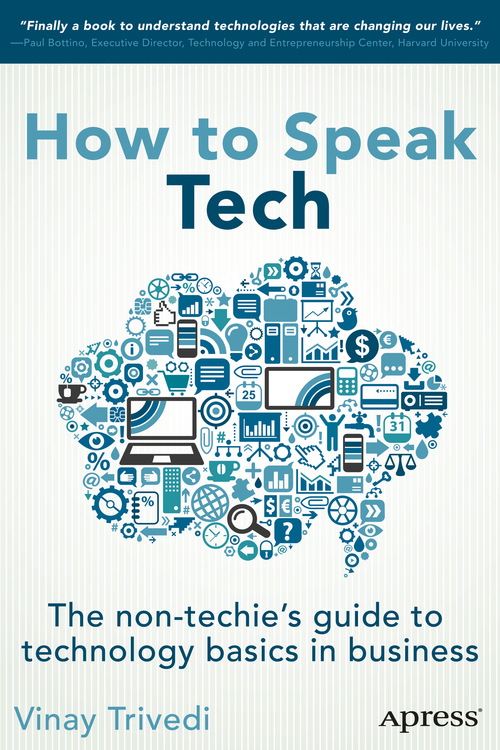 Vinay’s new book, How to Speak Tech: The Non-Techie’s Guide to Technology Basics in Business (Apress Media) spells out the essential technical terms and technologies involved in Internet startups and web applications in a way that almost anyone can understand. Nontechnical readers will find their digital literacy painlessly improved with each 10-minute chapter of this illustrative story of one successful technology startup building its Web-based business from scratch. But this book goes beyond just being a “Tech Talk for Dummies” approach. The world is hardly divided between folks who are fluent in all technologies and folks who know none – far from it. In these increasingly specialized times, many of us are much more conversant in some technologies than others; and that’s where the added value of this book really delivers. Maybe you have a firm grasp on Cloud and Hosting technologies, but need a clearer understanding of what’s involved in defending your project’s environment against security threats; or maybe for you it’s just the other way around. In either case, Vinay’s guide offers quick reads to help you get ready for your next conversation, so you don’t sound like a … well, like a dummy.